It has been described as a geologist's dream - a unique opportunity to study up close the volcanic processes that built the Earth's continents. 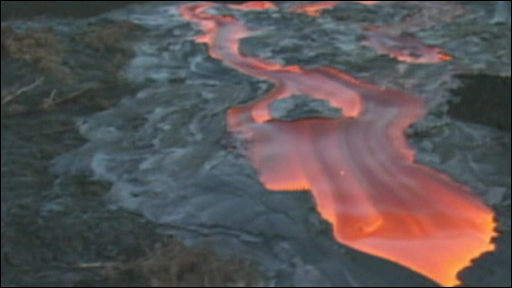 "Before, all we had to deal with were lava flows; but they are the end of a magma's life. They're lying there on the surface, they've de-gassed. It's not the natural habitat. "It's the difference between looking at dinosaur bones in a museum and seeing a real, living dinosaur roaming out in the field." Professor Marsh has been discussing the discovery here at the American Geophysical Union's Fall Meeting 2008. This is not the first time drillers have encountered magma; the depth of the hit and the setting are, however, thought to be unique. The exploratory well was being put down in the east of Hawaii's Big Island, through the basalt lava fields formed by Kilauea Volcano. The idea was to find steam from waters heated deep underground in fractured rock, to drive turbines on the surface to generate electricity. The company behind the project, Puna Geothermal Venture, has had a successful power operation in the area for 15 years. But the drillers were shocked - not only to hit magma but to also hit such a big heat source at the relatively shallow depth of 2.5km. "It's hotter than hell; it's over a thousand degrees centigrade," said Professor Marsh. Bill Teplow, a consulting geologist with US Geothermal Inc, who oversaw the drilling, stressed there was no risk of an explosion or of a volcanic eruption at the site. "It was easily controlled in the well bore because of the magma's highly viscous nature. It flowed up the well bore 5-10m but then the cool drilling fluid caused it to solidify and stop flowing," said Mr Teplow. "At no time were we in danger of losing control of the well." The breakthrough was made in 2005. Only now are researchers confident enough about their work to discuss the details publicly. They are not sure how large the magma chamber is, but some initial testing suggests it may have been put in place by activity from Kilauea in the 1950s, perhaps even the 1920s. Professor Marsh said the chamber was docile and slowly cooling. The consistency of the magma was like chilled pancake syrup, he said. It is hoped the site can now become a laboratory, with a series of cores drilled around the chamber to better characterise the crystallisation changes occurring in the rock as it loses temperature. 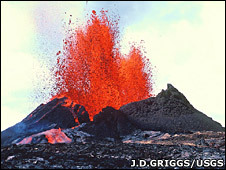 The magma is a dacite, making it chemically distinct from the basalt which forms nearly the entire mass of the Hawaiian Islands and the surrounding oceanic crust. It has a much higher silica content. Dacite magma chemistry is similar to that of the granitic core of the continents. 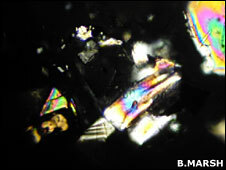 Professor Marsh said the Puna material, therefore, may represent the first time that the actual process of differentiation of continental-type rock from primitive oceanic basalt had been observed in situ. "Granites are about 75% SiO2 and basalts are about 50%. Average continental material is probably in between, at about 60%," explained Professor Marsh. "Here's one that turns out to be 67% silica. It's up there; it's a very respectable silicic magma. And it's in the middle of the ocean, and it could be this is how continents could have been started to be built on the planet." Geothermal experts are also fascinated by the event. The Kilauea encounter is by far the shallowest and the hottest encounter of rock in a commercial operation, and it will be studied to see if there are lessons that can be applied to electrical generation project elsewhere in the world. "We were at about 2.5km which is pretty routine drilling depth," explained Mr Teplow. "But that is half the depth of experimental projects in Europe and Australia where they are drilling very deep into hot granite - some 5-5.5km down - and getting 260C rock; and here we're getting 1,050C rock."